Yesterday marked the 25th anniversary of the airing of Emissary, the very first episode of Star Trek: Deep Space Nine. Although DS9 began as a spin-off of Star Trek: The Next Generation, it quickly took on a life of its own, producing some of the most well-rounded characters and the most intriguing stories in the Star Trek universe — and I say that as someone whose favorite Trek is TNG. In honor of this momentous occasion, here is a list of my personal favorite Deep Space Nine episodes. The penultimate episode of season 3 of DS9 isn’t one you’ll see on many “best of” lists, yet it remains one of my all-time favorites. Facets revolves around Dax — and while Jadzia Dax is not one of my favorite characters from the show, the idea of the episode was one I always enjoyed. In the episode, Jadzia goes through an ancient Trill ritual that allows her to talk to previous hosts of the Dax symbiote. The previous hosts’ memories are transferred into a volunteer. Sisko, Kira, Bashir, Odo, Quark, O’Brien, and Leeta all accept their roles and embody different previous hosts so that Jadzia can learn more about them and about herself. The episode was actually inspired by the movie Sybil, and the writer wanted to do something that explored the idea of multiple personalities — but, of course, in a Star Trek fashion. The idea of multiple personalities is something difficult to tackle in most television series, but Deep Space Nine found a unique and interesting way to use Jadzia Dax, a character with a symbiote that has lived inside multiple humanoid hosts, to allow the different “personalities” of Dax to emerge and to talk to Jadzia. In 1996, this particular episode of DS9 won a Hugo Award for Best Dramatic Presentation. The episode takes place 80 years in the future, as a dying Jake Sisko is visited by an aspiring novelist named Melanie who wants to know why Jake gave up writing. Jake agrees to tell his story. 80 years before, Jake went with his father, Captain Benjamin Sisko, on the USS Defiant to observe an inversion of the Bajoran Wormhole — an event that only took place once every fifty years. Of course, things don’t go all as planned, and the inversion causes a malfunction in Defiant’s warp drive. A blast of energy strikes Captain Sisko, and he vanishes. At first, Jake and the others believe he’s dead, but eventually they’re able to figure out that his temporal signature is out of phase — he’s out of sync with time. There’s no way to fix it, however. Jake sees his father periodically over the next 80 years as Sisko appears briefly from time to time, only syncing with the present for mere minutes. On the night of Melanie’s visit, Jake knows that he will see his father one last time — and has figured out how to save his dad, finally. He injects himself with a lethal hypospray as Sisko appears. Jake believes he is the tether that is keeping his father out of phase, and dying will set him free. Jake dies in his father’s arms and Sisko is thrown back in time to the moment of the accident and dodges the energy discharge. The story is beautiful and sad in so many ways; watching Jake age and lose the other parts of his life — his wife, his writing, etc. — as he obsesses over saving his father is absolutely heartbreaking. The fact that Sisko remembers everything, and that the future Jake who sacrificed so much will no longer exist, is also bittersweet. This episode is probably best known for spawning the “It’s a fake” meme. The reason I like this episode, however, has nothing to do with Internet memes. Throughout Star Trek: The Next Generation‘s run on television and its trek (pun intended) into film, Captain Picard made it very obvious that, in his belief, the core of protecting the Federation meant seeking out the truth and upholding what is right and good, as shared with us in the TNG episode The First Duty. In this episode of DS9, however, Sisko goes against all of that. The Federation is losing the war against the Dominion, and Sisko decides to do whatever it takes to get the Romulans to side with them. Sisko is down and dirty, making deals with the devil so to speak, and it’s very obvious that he regrets none of it. The Federation, Sisko declares, is about protecting itself first and foremost. Truth be damned! He even works with Garak to fabricate proof of the Dominion’s plan to invade and conquer the Romulan Empire after there is no hard evidence to be found. This kind of moral ambiguity and the dark places that DS9 was willing to go really set the entire series apart from its predecessors. Badda-Bing Badda-Bang probably wouldn’t make that many top DS9 episodes lists for most people, but I found this episode to be quite a lot of fun — and much more successful than their episode about baseball. Bashir and O’Brien are enjoying an evening at Vic’s in the holosuite, as they often do, until Vic’s long time rival Frankie Eyes shows up and throws Vic out. Despite the fact that this is a holodeck program, everyone gets interested and involved; Odo and Kira go “undercover” in Frankie’s casino and find out that Frankie works for a crime boss named Carl Zeemo. This leads to pretty much all of the senior staff of DS9 plotting a heist; if they rob the casino, they figure Zeemo will get mad and “off” Frankie, letting Vic take over again. 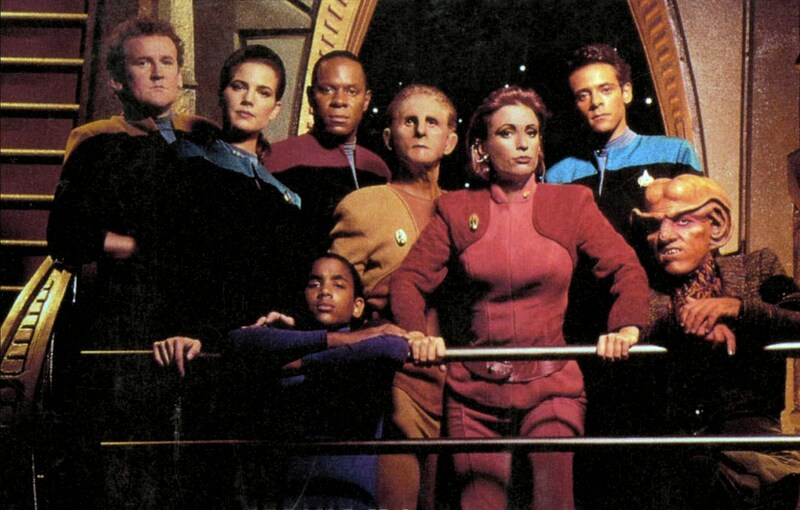 The heist involves Bashir, O’Brien, Odo, Kira, Nog, Sisko, Jake, and Kasidy Yates. Overall, the idea that these people decided to pull of a casino heist in a 1960s-era casino holodeck program is pretty ridiculous, but the episode is just too much fun. Speaking of fun episodes, Trials and Tribble-ations is another classic DS9 episode, and one of my favorites. The episode was aired as a tribute to the 30th anniversary of the original Star Trek series, and takes place mostly during said episode. This episode takes place mostly behind the scenes of the TOS episode The Trouble With Trubbles as the crew of the USS Defiant travel to 2268 and help foil an assassination attempt on Captain Kirk by a resentful Klingon named Arne Darvin. There’s even a scene where Sisko, posing as an ensign, gets to meet Kirk face to face and gets his signature on a daily log. Sisko, of course, takes this back to the future with him to keep as a souvenir — but who wouldn’t? This was, overall, a very clever episode and a great tribute to the original Star Trek.